"I'm sure that Russia is very disappointed." 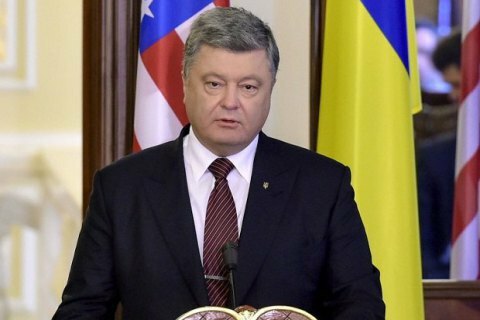 President Petro Poroshenko says the Ukrainian-American relations under the new US president demonstrate "fantastic dynamics". In an interview with the Inter, ICTV and Ukraina TV channels, Poroshenko recalled that "so many so-called specialists have painted the situation for Ukraine in totally black tones" after the coming of Donald Trump to power. But, Ukrainian president said, the situation is exactly the opposite: "The bipartisan support of Ukraine has intensified cooperation between the administration of President Trump and the administration of President Poroshenko, and between the Ministry of Foreign Affairs and the Department of State." He noted that Ukraine's Foreign Minister Pavlo Klimkin during his recent visit to the US met with the Secretary of State Rex Tillerson, with the National Security Adviser on national security issues Herbert McMaster, and other influential people in the White House and the US Congress. Poroshenko himself had meetings with Vice President Mike Pence and Tillerson, and had a phone conversation with Donald Trump on two occasions. "I am sure that the situation for Ukraine in the American establishment, in the White House, the Department of State is changing for the better, and I am happy about it, because more understanding comes, more willingness to act decisively to protect freedom and democracy." "I am sure that Russia is very disappointed," Poroshenko added.